A new and very interesting book by Nakajima Takahiro of the University of Tokyo Institute for Advanced Studies on Asia has just come out from Iwanami. 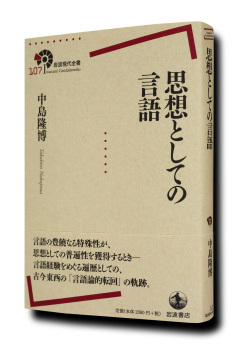 It deals with philosophy of language in Japan from Kūkai (774–835) to Izutsu Toshihiko (1914-1993). I look forward to reading it when it arrives in the post. Further details can be obtained from the publisher’s website (in Japanese). For those interested in Izutsu, Jean Connell Hoff’s translation of Wakamatsu Eisuki’s Toshihiko Izutsu and the Philosophy of Word: In Search of the Spiritual Orient was published by International House of Japan in 2014.